'Dormer House', the Mrs. Charles Otis Gates (nee Elizabeth Hoagland) estate designed by Theodate Pope Riddle c. 1916 in Lattingtown with landscaping by Ferruccio Vitale. Charles Gates was the president of Royal Baking Powder Co. and a professor of English literature at Adelphi College (and died in 1906). The subsequent owner of the house, George Sloane, had James O'Connor add a tennis court complex and William Lawrence Bottomley design alterations c. 1935. Click HERE to see 'Dormer House' on google earth and HERE on bing. 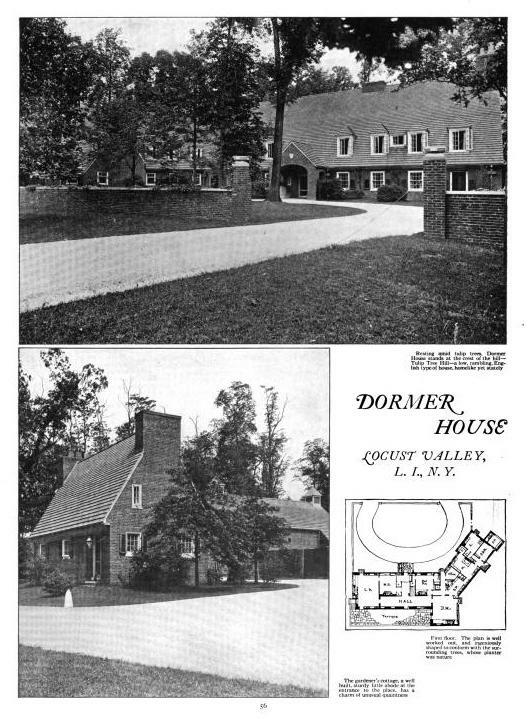 Photos from Country Life, 1919. George Sloane was inconsequential in the story- the real "mover and shaker" was his wife, Isabel Dodge Sloane a Dodge Automobile heiress and a game girl if there ever was one. The house was the epicenter of what was considered the North Shore's "fast set" during her lifetime. The house was subsequently owned by the opera singer, Patrice Munsel. Nice house, very subdued for a 'fast set' lifestyle. From what I can tell, the W. L. Bottomley alterations likely included a small new wing on the north side of the living room, giving the back of the house a more symmetrical look, & a very large new wing on the south (entry) side. I wonder the small wing was to shift the living room so a hall could be created allowing one to get to that large new wing without having to go through the living room? I understand the original windows are correct for this house but they’re not large windows & it seems to me that once draperies are hung the rooms are going to be a little dark. The windows in the large new wing appear larger. The circular drive has been replaced by an asphalt forecourt & the number of cars parked in it in every Bing rotation made me realize this house doesn’t have a garage – someone please tell me if I’m wrong. It’s a shame this house didn’t keep the acreage all the way to Lattingtown Road – I’m sure it made the rear vista much nicer. The James O’Connor tennis court complex is still there, now converted to a private residence & ironically (at least to me) with an outdoor tennis court next to it. What is identified as the gardener’s cottage in the ‘Country Life’ article appears to still be there & with a surprisingly large piece of open land next to it & the former outbuildings, which I’m guessing is also a separate, private residence now. Actually, Theodate Pope Riddle is a pretty big part of the story too. A woman of strong and eccentric opinions, about architecture (as one can see from this house) and everything else, she was one of the earliest practicing architects, a cousin of Philip Johnson, and now best remembered for her parents house, Hillstead, in Farmington, CT. designed by McKim, Mead & White under the thumb of young Miss Pope. Okay, so I'm back. I should be writing something for money, but instead I'm contemplating the subdivision of the property. One wonders what was going through the owner's head at the time---"okay, let's keep the garage complex, and some open field, but let's sell off the lot between the house and the road and hope that someone builds something big and ugly exactly in front of our drawing room windows? As for the Ferrucio Vitale landscaping, indeed landscape design is the most ephemeral of the design arts. Very little left there that he can be accused of, replaced by the ubiquitous ovolo cornered forecourt, and the too small little formal planting plopped in the middle of the lawn on the other side. DED: Isabel Dodge Slaone died in 1962 when the future of houses and properties like hers seemed bleak indeed. I think that it is fair to surmise that expediency dictated the division of the property with very little aesthetic thought brought to bear in the process. Was that huge brick mansion right next to the motor court there originally or was that one of the pieces sold. It seems so close. A fantastic house in person. The new house happened relatively recently-terrible mistake ,including cutting into the fantastic brick wall that surrounds the estate. As to Riddle, the campus she designed (and paid for) for Avon Old Farms School is probably the most extraordinarily charming group of boarding school buildings in the US. On a hot summer day it was surprisingly light & cool indoors, no doubt owing to the high roofline. Was there a small plunge pool in the basement, below the newer south wing? The house next door is 'Whispering Pines', built in 1921. They are both outstanding homes, but again, I am amazed at how close they are built together. You would think there would be some more land between them. Patrice Munsel was the person who named the place "Lockjaw Ridge". 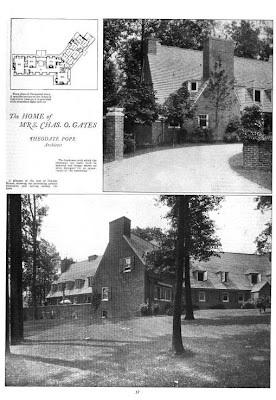 Article mentions another estate "Tulip Tree Hill"??? Would that have been "Whispering Pines" or another place? Tennis complex also has mynas link for photos. Link to Theodate Pope Riddle's body of work - move down to almost the end for an interesting bit on Dormer House. Comment at YouTube after doing Google search for Lockjaw Ridge "I hear that lifted trucks and tattoos﻿ are quite popular there. Old money is moving out, the tide seems to be turning." It pertained to Oyster Bay. The house originally belonged to J.M Townsend and, pre-additions, has a real Bottomley look (link attached, I hope, below). I do, like the additions (exterior) and if you look at Hickory Hill you can see, in the rear of the guesthouse , another example of Bottomley's use of a semi hexagonal addition. The double doors are indeed later additions and I am guessing the missing shutters are due to an uninspired effort to miss the downspouts. In person, the arched courtyard at the top of the driveway/hill is wonderful. Whoops. Last post was meant for Clayton. I've always assumed that the jobs at the zoning commissions on Long Island were set aside for necromancers. Zack, how can I send you some images?